What's the weirdest movie you've ever seen? Surreal horror like David Lynch's Eraserhead (1977) or maybe absurdist comedy like The Lobster (2015) or Swiss Army Man (2016)? 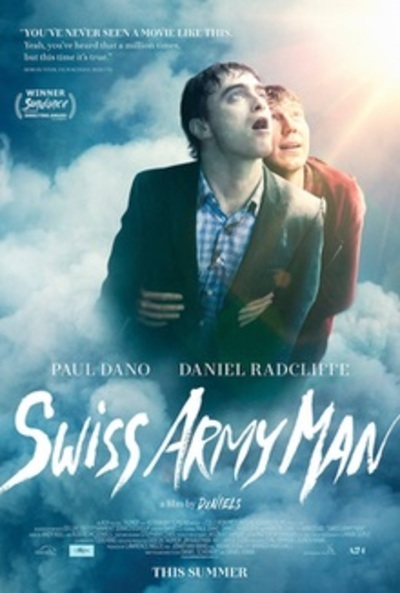 Swiss Army Man poster, fair use. Two of the weirder ones that come to mind are Vanilla Sky and 12 Monkeys. I really did 'get' either of them, even though I've seen 12 Monkeys many times. I can think of a few. The Lobster was a strange one I saw recently. A few years back I saw a really odd comedy called Nothing, about too friends who discover that they can wish things they don't like out of existence, which inadvertently causes them to destroy the world. That one probably takes the cake for me. John Dies at the End is another odd one, about two guys who take a mysterious drug the call soy sauce that allows them to see things other people can't (ghosts, freaky spider monsters, demons etc). Tideland was also really odd- about a little girl who imagines her dolls are talking to her (it's far stranger than that, but hard to describe).